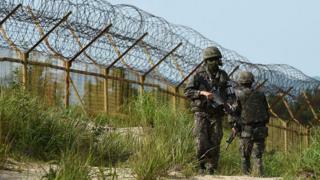 South Korea's military has fired warning shots at North Korean guards searching for a soldier who defected. The North Korean soldier had walked across the Demilitarised Zone (DMZ) shortly after 08:00 (23:00 GMT Wednesday). He had emerged from thick fog at a checkpoint, said the South's military. He is the fourth North Korean soldier to defect this year. The incident comes weeks after one of the most dramatic defections in recent times. In that incident, on 13 November, a soldier was shot as he fled across to the southern side of the Joint Security Area (JSA) in the village of Panmunjom. Thursday's incident took place at a checkpoint in the mid-western frontline, said Roh Jae-cheon, spokesman for South Korea's joint chiefs of staff. Heavy fog had descended on the area, limiting visibility to about 100m (110 yards), he told reporters. 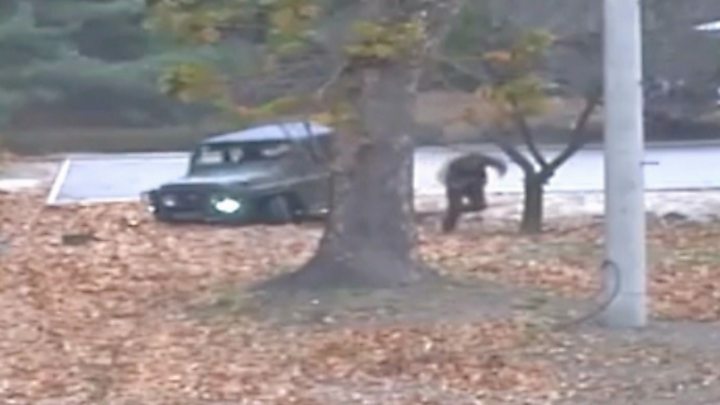 But as the North Korean soldier approached the post, his movements were picked up on surveillance equipment. Mr Roh added that the defector was taken into custody and was "safely secured". Authorities are now investigating what drove him to make the crossing. The soldier, thought to be 19 years old, was carrying an AK-47 rifle, reported The Korea Herald citing the military. No gunfire was exchanged at the time. But shortly after his crossing, a group of border guards from the North approached the border, appearing to search for their comrade, according to South Korea's defence ministry. South Korean soldiers fired about 20 warning shots. Officials said the sound of gunshots coming from the North was heard about 40 minutes later, although no bullets were found to have crossed the border. Very few North Korean defectors risk crossing to the South via the DMZ. One of the world's most heavily guarded strips of land, the DMZ is a thin buffer zone between the two Koreas and is fortified on both sides with barbed wire, surveillance cameras, electric fencing and landmines. Last month's defection saw a soldier drive a jeep right up to the border, in a dramatic escape captured on surveillance cameras. He ran across to the South in a hail of bullets from North Korean guards. Shot five times, the soldier collapsed in a pile of leaves on the South's side, and was later rescued by South Korean soldiers. His recovery was closely tracked by South Korean media. He was released from intensive care and is reported to have written a thank you note to the doctors who treated him. Two other North Korean soldiers defected, also via the DMZ, in June this year in separate incidents. Only one soldier defected last year. The total number of North Koreans who directly defected to the South has also risen to 15 this year, compared to five last year, according to official figures reported by Yonhap news agency. Hundreds more defect through China, before making their way to the South. In a separate announcement on Thursday, South Korea's unification ministry said two defecting North Koreans had been found on a fishing boat in the South's waters.